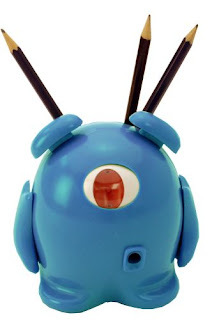 Burper (Nibble) the pencil sharpener!!!! This is Nibble the pencil sharpner, but I call him Burper because her burps & says 'oops sorry!' after he's chewed on your pencil!! He was centre of attention on my WOYWDW post & he got lots of comments! This is so lovely, I may just have to invest once I come back from my hols.